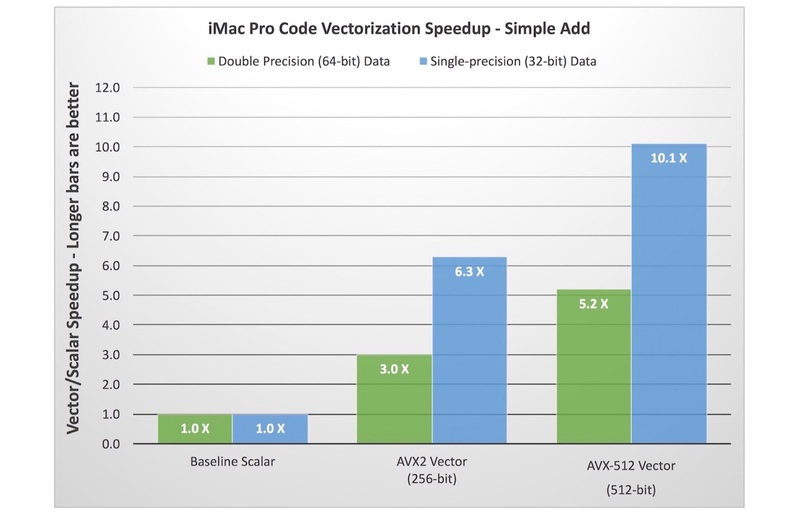 iMac Proに搭載されるXeon Wプロセッサは「Intel AVX-512」をサポートし、ベクトル化されたコードはパフォーマンスが向上。 | AAPL Ch. 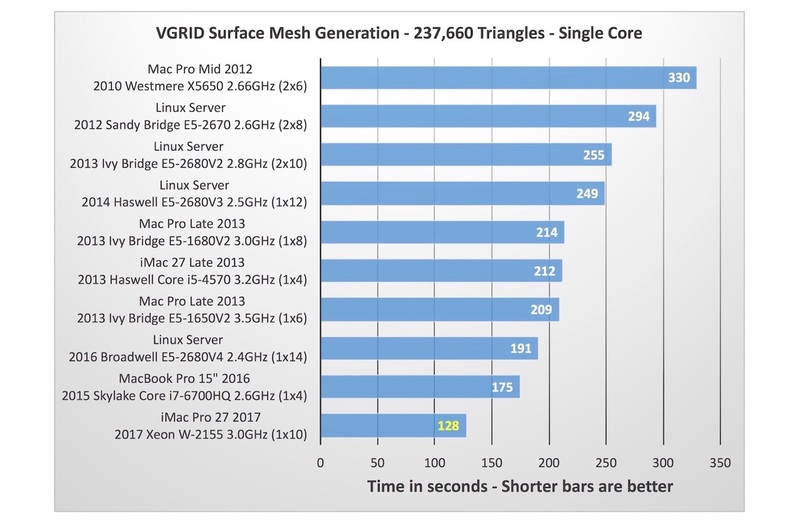 The Xeon W also happens to be the first CPU in a Mac to support Intel’s AVX-512 vector processing, which increases the width of vector registers to 512 bits (up from 256 bits in AVX2) and doubles the number of vector registers to 32 per core (up from 16 in AVX2). I’ll talk more about that in a bit. You’d be right to expect an 8X increase in performance here, but in reality that’s a bit theoretical and in the real world it’s going to be less. How much less depends on a lot of things, like the data size, whether it fits in the various caches or spills onto RAM, and so on. But in this case, picking N=512, the results are pretty good, with a 5.2X speedup from AVX-512. For comparison, I also included AVX2 results, using 256-bit wide vectors that can hold 4 doubles at a time. This nets a 3.0X speedup. And though I won’t get into the coding details here, running the same tests using single-precision floats nets speedups of 10.1X for AVX-512 and 6.3X for AVX2. Most of my apps have around 20,000-30,000 lines of code spread out over 80-120 source files (mostly Obj-C and C with a teeny amount of Swift mixed in). 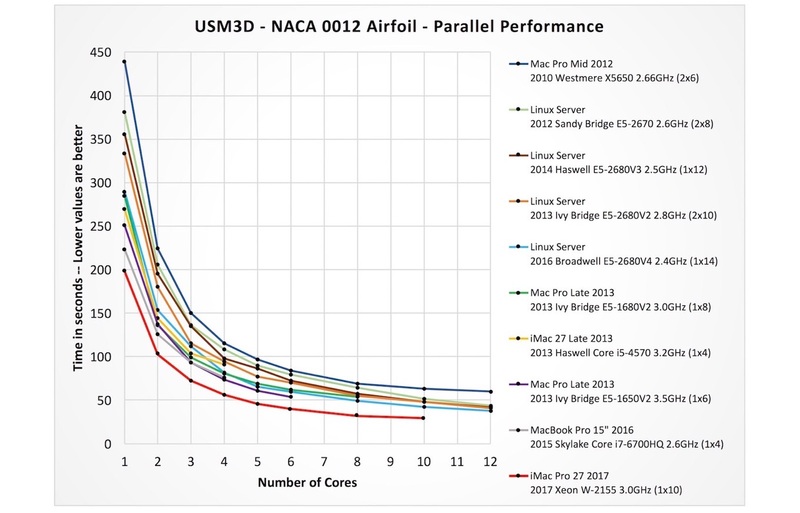 There are so many variables that go into compile performance that it’s hard to come up with a benchmark that is universally relevant, so I’ll simply note that I saw reductions in compile time of between 30-60% while working on apps when I compared the iMac Pro to my 2016 MacBook Pro and 2013 iMac.